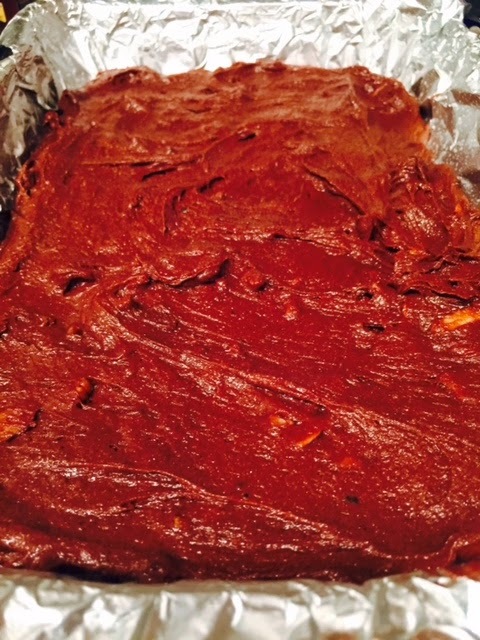 Cayenne Cinnamon Brownies ... OH MY!!! 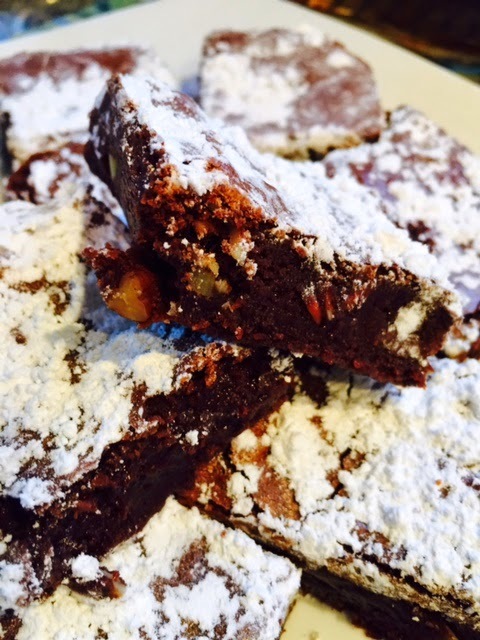 You know those times when you have a serious craving for something and your mind takes you back to the moment when you first had the food that you're craving....well, these brownies were one of those moments. 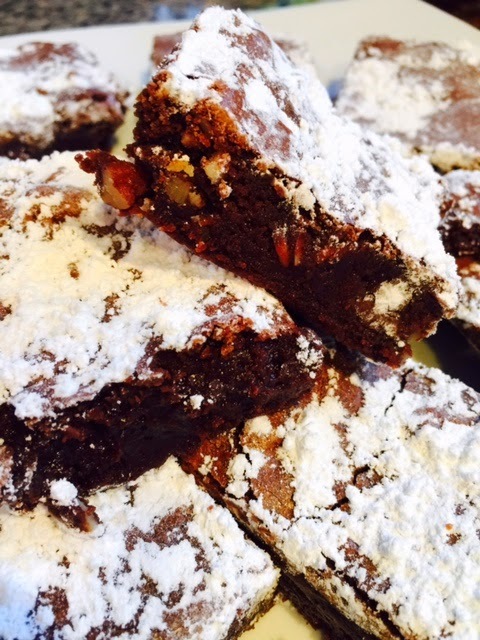 I had the most amazing spicy brownies in Balboa Park in San Diego a few years ago and I have been craving them ever since! If you ever have a chance to visit San Diego, Balboa Park is definitely on the must-see list. I still remember that day...I had gone to see a few museums with my parents, it was a bit chilly so we stopped for a little snack and some coffee at one of their snack stands near the Prado restaurant (another must go to, food is amazing! ) . 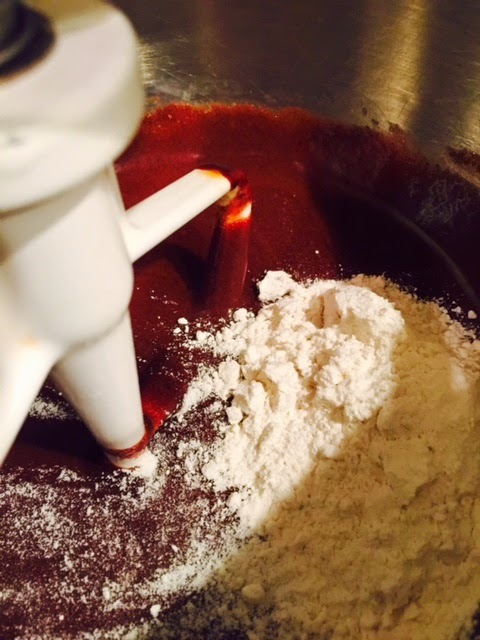 Well, as you can see from my latest recipe Cayenne Cinnamon Brownies OH MY!!... I still remember those brownies. I think I got pretty close to duplicating the flavor. These brownies are full of chocolate flavor with a bit of heat from the cayenne that hits you a bit later. Honestly, I know the combination sounds strange... but it really does work. I researched a few recipes online that were similar, but as I played in the Livebakelove test kitchen, this combination really seem to have worked. I really hope you give this recipe a try... full of flavor and taste and perfect to fill that chocolate craving with a little twist! 3. 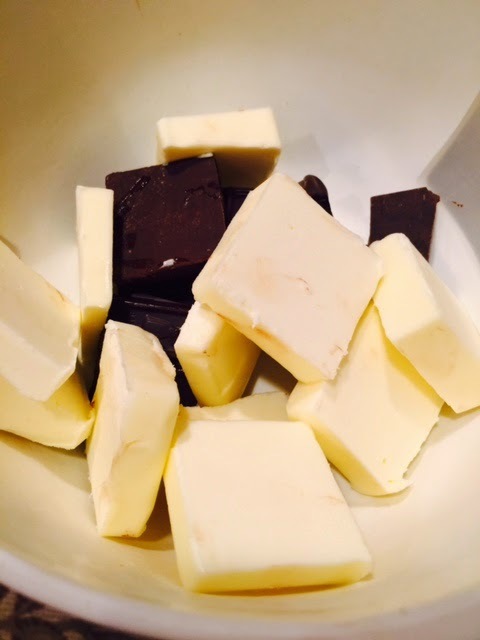 Melt chocolate and butter in microwave safe bowl in microwave for 1 minute. Remove and stir until combined. 4. 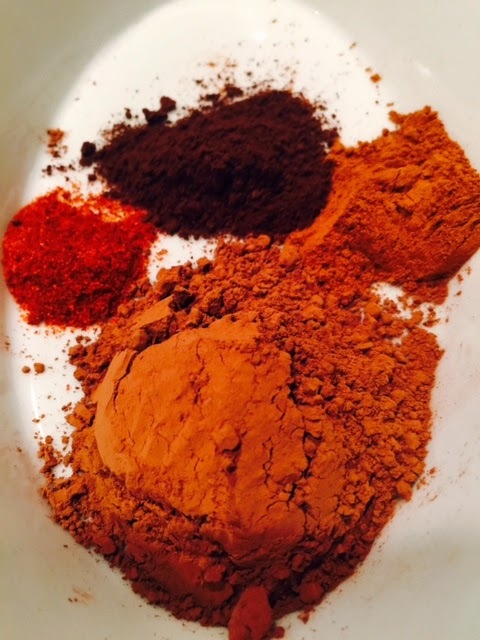 Combine cocoa powder, cayenne, instant coffee, cinnamon and salt. 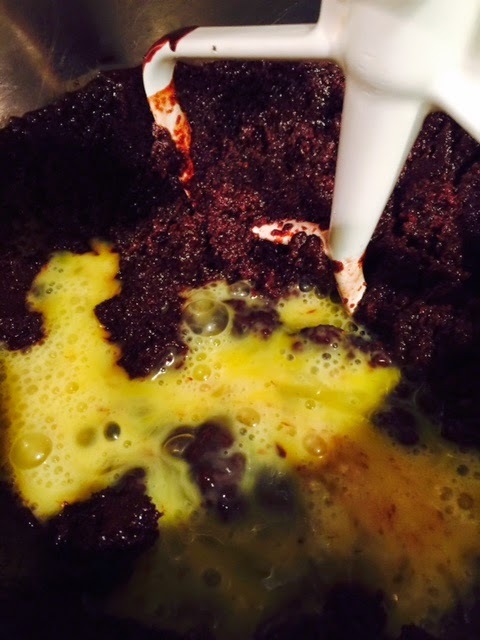 Mix into chocolate butter mixture and set aside. 1. 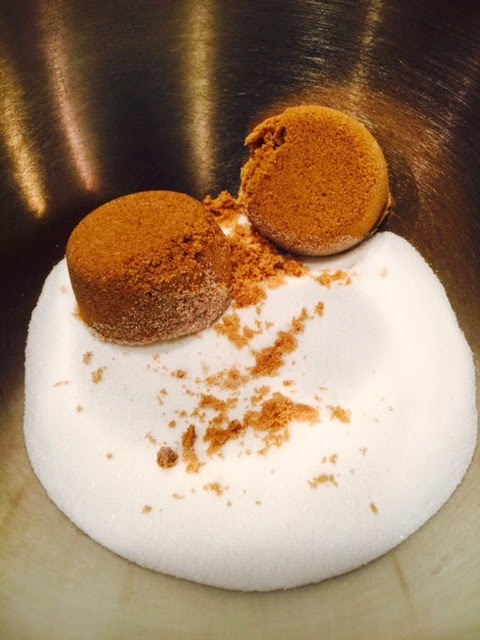 In a large mixing bowl add white sugar and brown sugar and mix together. 2. Add chocolate, butter and spice mixture slowly into sugar. 3. Beat the 3 eggs together and add them into mixture with vanilla. Combine. 4. Add flour slowly still all mixed together. 6. 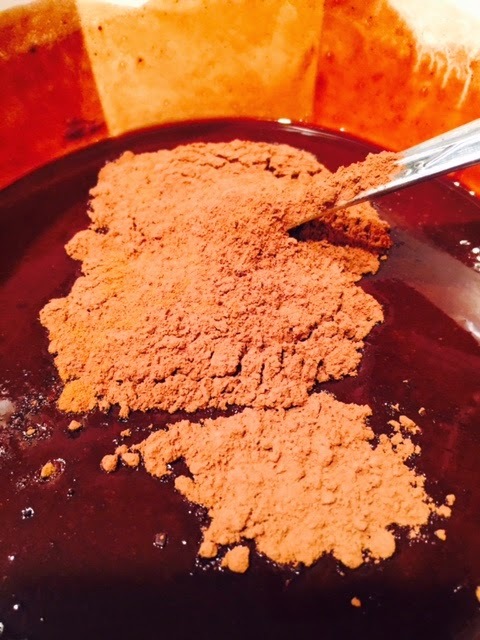 Pour brownie mixture into prepared baking pan and spread into an even layer. 8. Remove from oven and cool. For this month's Leftovers Club, I was paired with Ginger from Stark Raving Delicious. I read that Ginger recently started following a grain-free, dairy-free, processed sugar-free diet which was challenging for me. Although I recently made all gluten-free cupcakes for a wedding, coming up with recipes to meet special dietary restrictions is challenging and often involves a lot of research. For example, by reading this article on Grain Free Living, I learned that there are hidden sources of grains in many foods you wouldn't think would have them. Even though Ginger was sweet enough to say she didn't have any dietary restrictions, I definitely wanted to send her something she could enjoy, but I didn't want to take risk inadvertently including a ingredient that contained any of her allergens so I immediately thought of nuts! 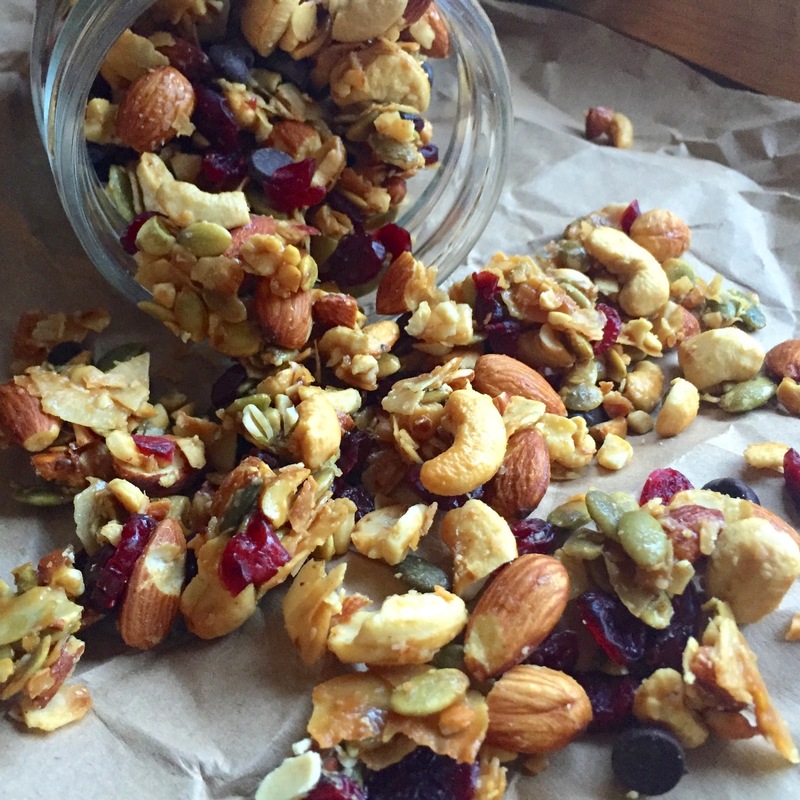 Nuts are healthy, are not a grain and can be made into "granola" or trail mix that is free from dairy and processed sugar while still tasting delicious - yay! 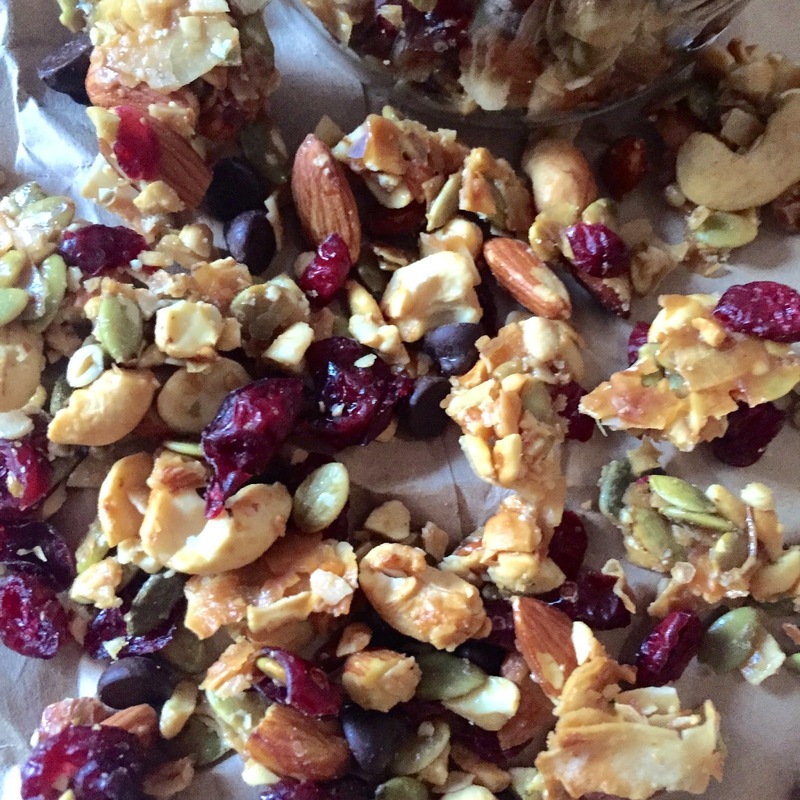 While the combination of ingredients I used is more of a "trail-mix", I decided to call it "granola" because of the chunky texture it gets during the baking and cooling process. 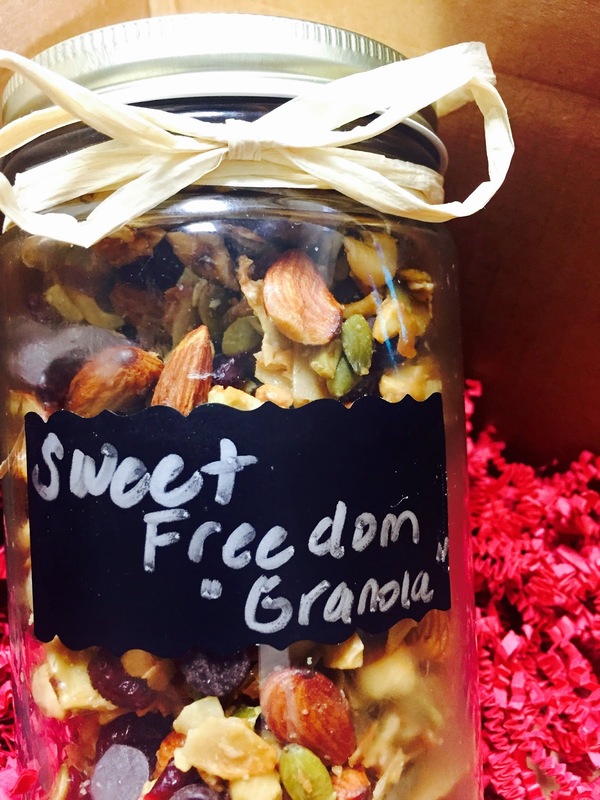 Although the recipe doesn't contain any grains, you really feel like you're eating granola. Preheat oven to 300f and line a rimmed baking sheet with parchment paper. 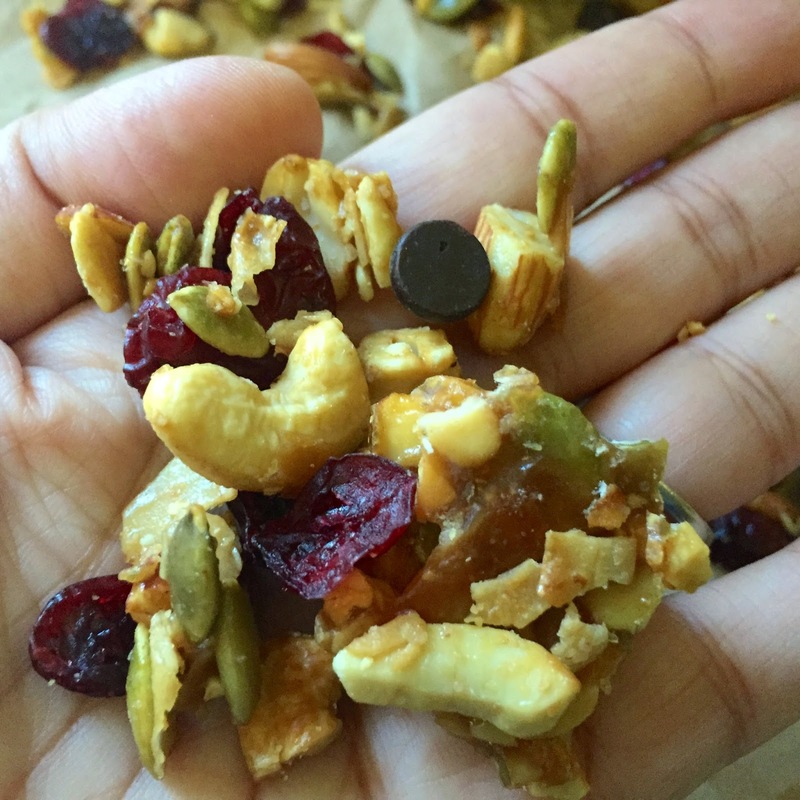 Place the cashews, almonds and coconut in a food processor and pulse a few times just to break up some of the pieces. Place the honey, coconut oil and vanilla in a large microwave safe bowl and heat approx 40 seconds. Stir well to melt the coconut oil. 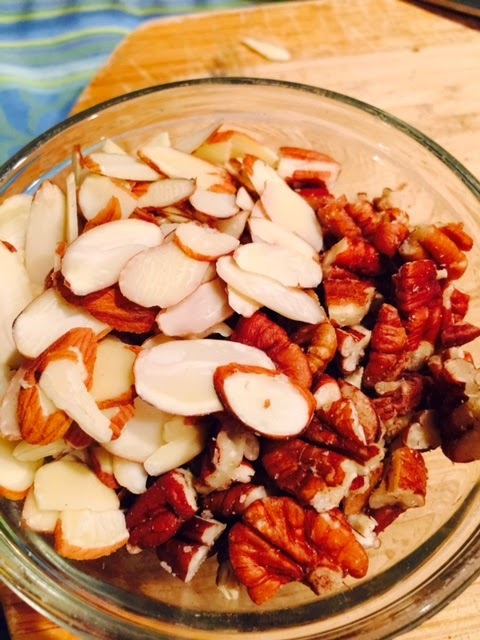 Add the nut-coconut mixture to the bowl and add the pepitas. 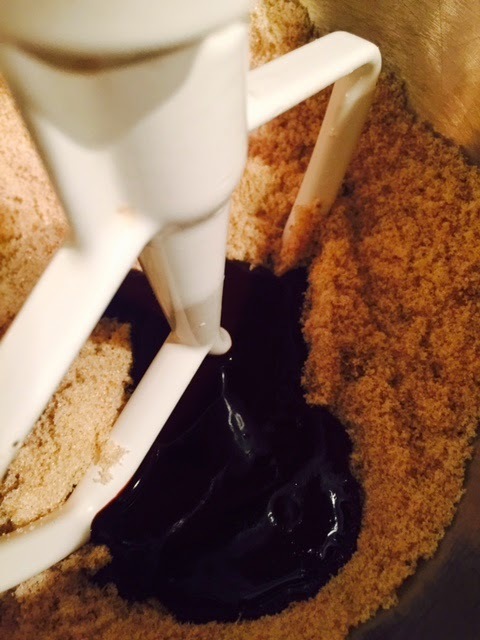 Stir with a rubber spatula to combine making sure the mixture is evenly coated. Dump onto the prepared baking sheet and spread into an even layer. Bake for 15 minutes then stir. Continue baking for another 10 minutes or until the nuts are browned and toasted. Remove from oven and sprinkle the dried cranberries and salt over the mixture. 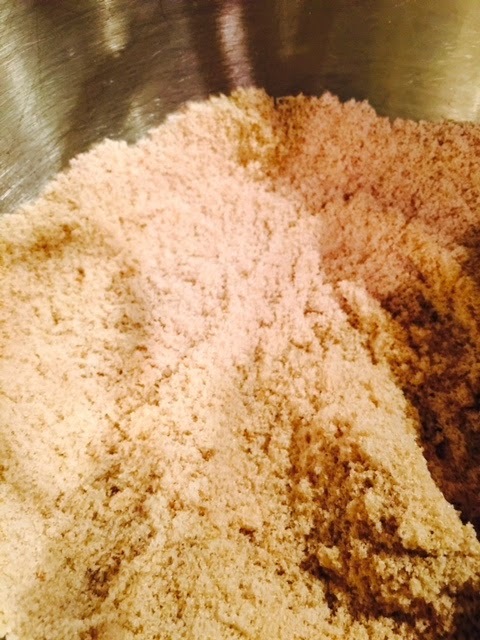 Toss to combine then spread in an even layer and flatten slightly to compact the mixture. You want the mixture to harden into a solid mass as it cools so you can break it up into chunks once it has cooled. Allow to cool for 20-25 minutes then break into chunks. Add dark chocolate chips (or any other add ins you want) and store in an airtight container for up to 1 week. If you'd like to receive yummy goodies in the mail from fellow bloggers each month, why not sign up to participate in The Leftovers Club. You (and your tummy) will love it! Note: If you're wondering if the Enjoy Dark Chocolate Chips are considered paleo (like I did), check out this article on The Paleo List. The dark chocolate chips are widely accepted as being paleo.